This week we review the original road trip movie, Ingmar Bergman’s Wild Strawberries . Ok, cards on the table, despite Lewis and I being the internet’s premier film podcasters (right?) neither of us had actually seen a Bergman film before. Yes, yes, yes, I know that’s not particularly surprising for me, but Lewis? He’s supposed to be the one who watches all the films. A recommendation from our friend Jason, Wild Strawberries was released in 1957 and just 10 months after probably Bergman’s most famous film The Seventh Seal. If only Bill and Ted’s Bogus Journey had referenced Wild Strawberries too and maybe Lewis and I would have heard of it! The film follows Professor Isak Borg, an old, grumpy but respected doctor, on a long drive from Stockholm to Lund. Due to receive a honoury degree at Lund University, the doctor’s journey takes him through various places from his childhood and adult life. Accompanying him is his daughter-in-law and various hitchhikers who they meet on the way. The simple plot masks a film that asks fundamental questions about life, love and what we learn about ourselves as we get older. Both Lewis and I loved it and were especially affected by the performance of Victor Sjöström, who lays Isak. Despite playing a character who is in many ways unlikeable, Victor imbues Isak with a vulnerability that makes you sympathise and understand him. 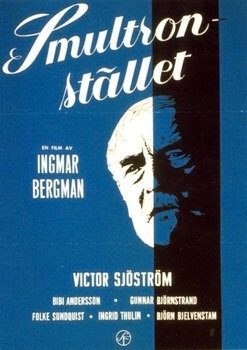 The film has certainly inspired us to seek out more Bergman films. No longer will we embarrass ourselves at the annual Film Podcasters Conference (this year to be held in Ipswich). Last but not least, our Secret Sponsor for this week is Dan (@Top10Films) – check out his excellent film-based list work at http://www.top10films.co.uk.